Smart lighting, smart energy management systems, and smart security systems, so why not smart workplaces? Smart offices are the workplace of the future and are expected to have a global market value of $46.11 billion by 2023. A smart office uses connected digital technologies to create an intelligent, responsive work environment that engages and empowers employees. In a smart workplace, operations are unified under one system that enables, improves, and simplifies decision-making. Geographic information system (GIS) - GIS ingests and integrates different types of location-based data to create 3D visualizations and maps. GIS technology can be used to create indoor or outdoor maps, and the resulting map data can be displayed in a variety of different apps. Indoor positioning system (IPS) - An IPS is one type of GIS system specifically used to locate and track objects or people within buildings. Different systems may have different ways of tracking objects (wireless, optical, etc. ), but they all have the ability to label or tag objects within a building. Internet of Things (IoT) devices - IoT refers to the network of physical objects that connect to and communicate with other systems. IoT sensors, beacons, and other devices are used to inform IPS and GIS systems with real-time data on energy usage, space usage, and much more. Indoor mapping integrates all of these technologies into a detailed digital twin of your smart office. The data generated by IoT devices feeds into the indoor positioning system, which is translated into points on your 3D map, giving you an easy (and visual) way to digest tons of workplace data. Your IoT data, combined with the precision of a detailed 3D map, helps you analyze how you use space, energy, and other resources for a more efficient and productive office. Indoor maps connect spatial data to physical locations in the building, allowing a company to better visualize the workspace and utilize space to its fullest potential. IoT devices communicate with every connected object in the system to display the accurate location of all objects at all times, in essence creating a living digital twin of your building. Indoor maps give better insights into that data. For example, say IoT devices indicate the second floor is using more energy than any other floor. Integrating this data in an indoor map can identify which conference rooms, departments, etc., are using the most energy in order to determine the root cause. This reduces the time it takes to resolve issues, improves energy and maintenance efficiency, and reduces waste. Indoor maps connect with IoT data to show real-time usage information, such as what workstations or conference rooms are available. This data can be used to automate scheduling, monitor workflow, and make informed decisions about how, when, and why your spaces are used. When your 3D map is built into a custom app, employees can view real-time data in desktop or mobile applications. Armed with this data wherever they go, employees can find locations for spur-of-the-moment meetings—even if it’s their first time in a new office or on a new floor. This real-time information reduces frustrations, improves productivity, and saves money by using space as efficiently as possible. 3D maps can help visualize security and resource needs. With IoT information in a 3D map, facility managers and executives can observe security coverage and make sure security resources are allocated appropriately across the building. An indoor map integrates collected and stored data with real-time spatial intelligence to provide insight into usage and resources—and potentially overuse or underuse of certain resources—that other monitoring tools can’t provide as effectively. Indoor maps allow you to add detailed information to your smart building assets, including everything from office chairs and laptops to heavy kitchen equipment and HVAC systems. With this information, facility managers can keep track of maintenance schedules, complicated equipment requests, and ever-changing schedules. They can also monitor fire extinguishers and fire sprinkler systems for emergency preparedness. Companies can also set up alerts that display a notification on the map when something requires maintenance, and send an automatic notification to the appropriate personnel. This further offloads the tedium to alert and guide facility managers to issues. 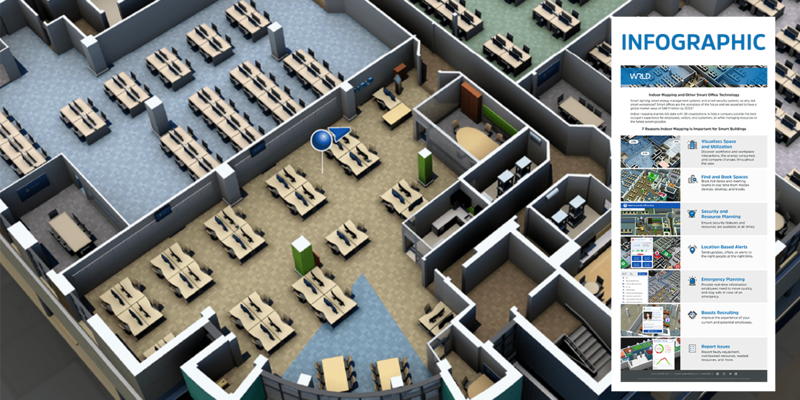 A 3D indoor map improves emergency planning for employees, facility managers, and security personnel alike. In the case of an emergency, an indoor map provides the real-time information employees need to move quickly and stay safe. When the fire alarm or other security alarm is triggered, your indoor mapping system can automatically send an emergency notification to employees that shows the best way to an indoor or outdoor protected area. Companies can also add CPR kits, defibrillators, first aid kits, and other safety items to the map for easy identification and access. These items can be marked throughout the map, or they can be highlighted in case of an emergency. Virtual indoor maps also help companies evaluate their emergency preparedness. They can be used to monitor practice drills to see where bottlenecks occur to improve evacuation procedures, or to evaluate the placement of defibrillators and other important medical equipment. According to the Future Workforce study from Dell, 81% of millennials say the technology available in a certain workplace affects their decision to take the job, and more than 70% of millennials expect to work in a smart office in the next five years. Your smart office—paired with a 3D map that shows it off—is a great way to improve the experience of your current and potential employees. Attracts potential candidates by displaying a work environment and high-tech culture that stands out from the rest. Helps candidates find their way around when they visit by providing navigation instructions through the company’s mobile app or through a kiosk in the building. Acclimates new (and visiting) employees easily by providing easy navigation directions and highlighting important spots like bathrooms, break areas, coworking spaces, and more. Creating a digital twin of the physical workspace is a great way to set yourself apart from other employers, and it also helps global companies make their employees feel at home, no matter which office they’re in today. An indoor map makes it easy for employees to point to a specific location in the office and report faulty equipment, overbooked resources, wasted resources, and more. This reduces the time maintenance staff spends rooting around for issues, and results in quicker resolution of pressing issues. When employees have an intuitive way to report issues and they feel like they’re being heard, employee satisfaction and retention improves. When you pair an IoT-enabled smart office with a 3D indoor map, the results are amazing: increased productivity, greater talent attraction, and reduced overhead costs. When these maps are incorporated into employee-facing apps, your workers reap the benefits of an interconnected workplace with real-time data about navigation, meeting rooms, resource allocation, and much more. Sign up for free to start creating your own indoor map, or learn more about our custom indoor mapping services.